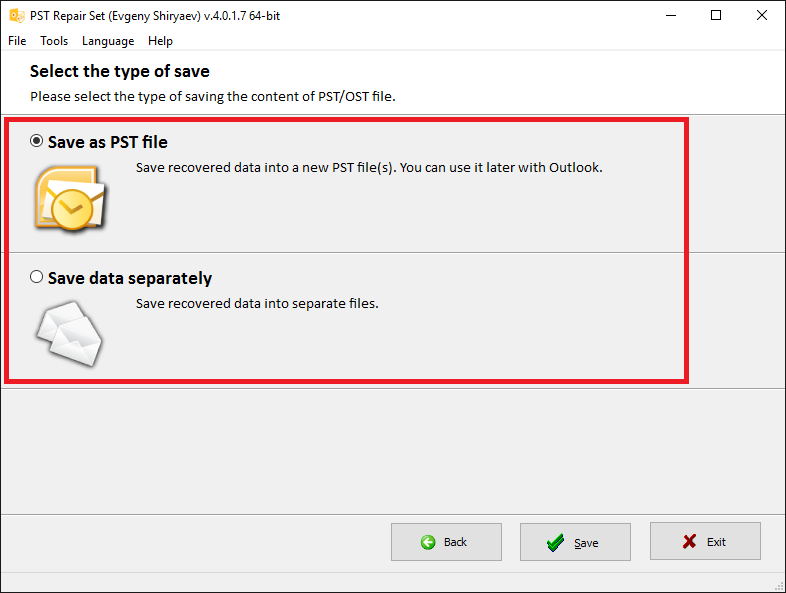 Very simple and intelligent repair PST solution to eliminate email issues. All copyrights to PST Repair Set, Inc. are exclusively owned by the author - PST Repair Set, Inc.
A Personal usage license. 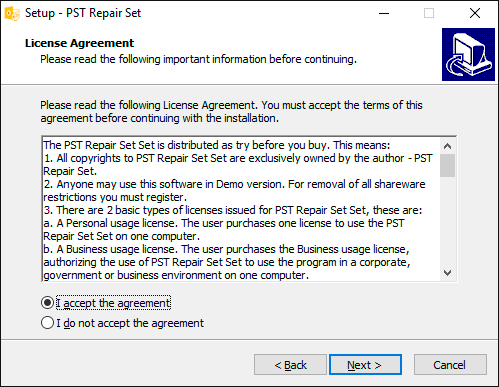 The user purchases one license to use the PST Repair Set on one computer. A Business usage license. 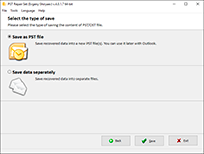 The user purchases the Business usage license, authorizing the use of PST Repair Set to use the program in a corporate, government or business environment on one computer. A SITE usage license. The user purchases a single usage license, authorising the use of PST Repair Set, by the purchaser, the purchaser's employees or accredited agents, on an unlimited number of computers at the same physical site location. This site location would normally be defined as a single building, but could be considered to be a number of buildings within the same, general, geographical location, such as an industrial estate or small town. Once registered, the user is granted a non-exclusive license to use PST Repair Set on as many computers as defined by the licensing terms above according to the number of licenses purchased, for any legal purpose. The registered PST Repair Set software may not be rented or leased, but may be permanently transferred, in it's entirety, if the person receiving it agrees to the terms of this license. If the software is an update, the transfer must include the update and all previous versions. 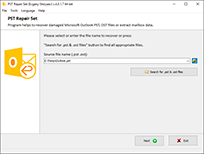 The PST Repair Set Demo version may be freely distributed, with exceptions noted below, provided the distribution package is not modified in any way. No person or company may distribute separate parts of the package with the exception of the PST Repair Set components, without written permission of the copyright owner. 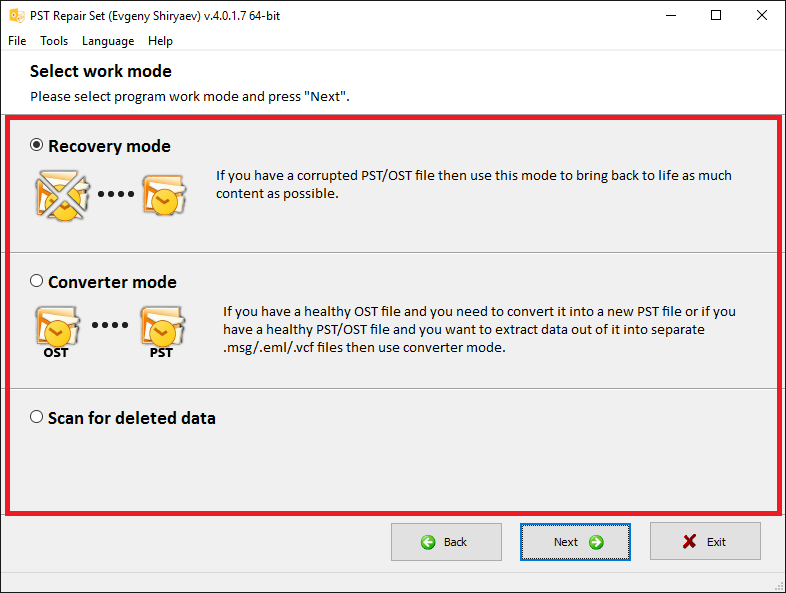 The PST Repair Set Demo version may not be distributed inside of any other software package without written permission of the copyright owner. THE PST Repair Set IS DISTRIBUTED "AS IS". NO WARRANTY OF ANY KIND IS EXPRESSED OR IMPLIED. YOU USE AT YOUR OWN RISK. NEITHER THE AUTHOR NOR THE AGENTS OF THE AUTHOR WILL BE LIABLE FOR DATA LOSS, DAMAGES, LOSS OF PROFITS OR ANY OTHER KIND OF LOSS WHILE USING OR MISUSING THIS SOFTWARE. You may not use, copy, emulate, clone, rent, lease, sell, modify, decompile, disassemble, otherwise reverse engineer, or transfer the licensed program, or any subset of the licensed program, except as provided for in this agreement. Any such unauthorized use shall result in immediate and automatic termination of this license and may result in criminal and/or civil prosecution. 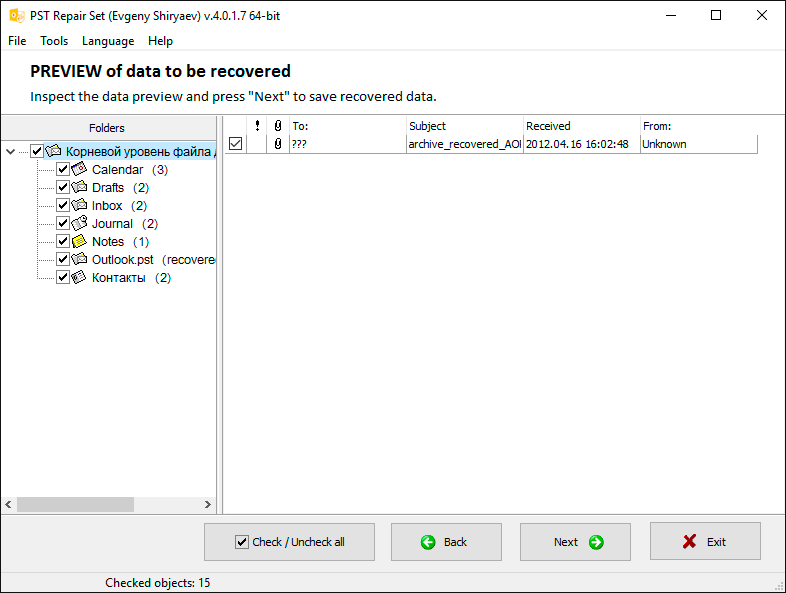 Neither PST Repair Set binary code or Address Book source may be used or reverse engineered to re-create the PST Repair Set algorithm, which is proprietary, without written permission of the author. 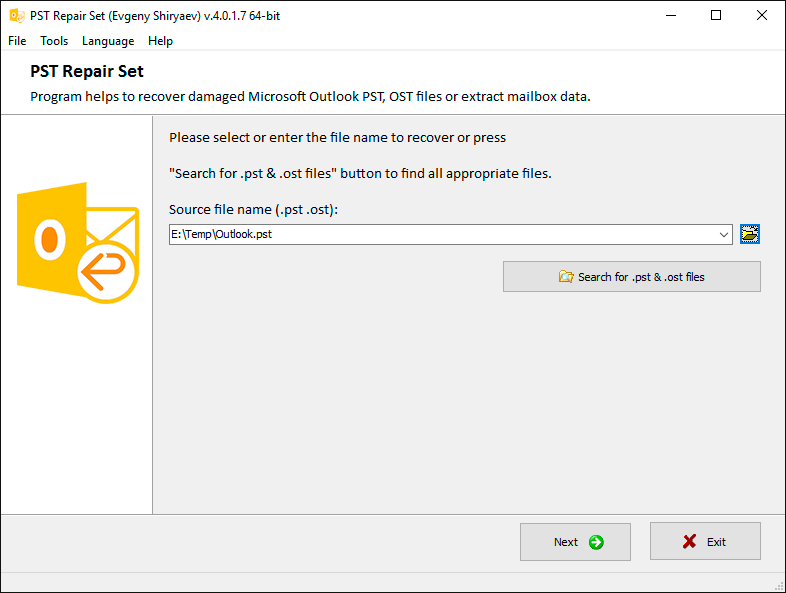 PST Repair Set keyfiles may not be distributed, except as stated in item 3) above, outside of the area of legal control of the person or persons who purchased the original license, without written permission of the copyright holder. All rights not expressly granted here are reserved by PST Repair Set, Inc. 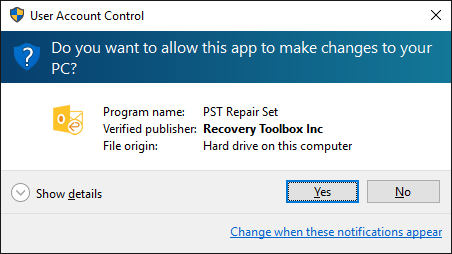 Installing and using PST Repair Set signifies acceptance of these terms and conditions of the license. Copyright © PST Repair Set, Inc. All Rights Reserved. The information contained in this site is copyrighted and may not be distributed, modified, reproduced in whole or in part without the prior written permission of PST Repair Set, Inc. The images from this site may not be reproduced in any form without the prior advanced written consent of PST Repair Set, Inc.
PST Repair Set, are USPTO registered trademarks of PST Repair Set, Inc. The absence of a brand or product name or logo from this list does not constitute a waiver of any PST Repair Set, Inc. or other intellectual property right concerning that name or logo. The entire content of this website is copyrighted to PST Repair Set, Inc. and should never be reproduced/copied to another website without written authorization from the owners of PST Repair Set, Inc.
By visiting https://www.pstrepairkit.com/, you agree that the laws of Russia, without regard to principles of conflict of laws, will govern these Conditions of Use and any dispute of any sort that might arise between you and PST Repair Set, Inc. must be settled in the courts of Moscow, Russia; and you agree to jurisdiction in such courts. PST Repair Set, Inc. (PST Repair Set) is committed to maintaining the privacy of the information you share with us. We will never sell, distribute, or rent information about you and your purchases at PST Repair Set. We will only use the information you share with us for the purposes of enhancing your use of our web site, products, services, or, with your permission, sending you information about our products and services. If you use a credit card to purchase a PST Repair Set's product, the credit card number is encrypted as it passes over the Internet. Your credit card number is not kept or recorded by PST Repair Set or our computers - it is simply passed through to the credit card company to purchase the course. In this respect, buying a course from PST Repair Set is similar to a credit card purchase at any store. Neither PST Repair Set nor the store keeps your credit card number on file. PST Repair Set does use the services of third parties, such as e-mail service providers, purchase and order processing merchants and marketing companies that act as independent contractors on behalf of PST Repair Set. These parties are contractually prohibited from using personally identifiable information for any purpose other than for the purpose PST Repair Set specifies. We do provide non-personally identifiable information to certain service providers for their use on an aggregated basis for the purpose of performing their contractual obligations to us. We prohibit the sale or transfer of personal information to entities outside of the PST Repair Set's affiliates for their use without your approval. In the event that all or substantially all of PST Repair Set's stock and/or assets (or the assets of a division or subsidiary) are transferred or sold to another entity, or PST Repair Set (or a division or subsidiary) is acquired by, or merged with, another entity, PST Repair Set may transfer personally identifiable information to the acquiring entity and PST Repair Set may provide to such entity customer information that is related to that part of our business that was sold to or merged with the other entity without your consent. If, as a result of such a business transition, your personally identifiable information will be used in a materially different manner, you will be given choice consistent with our policy regarding notification of changes. provide functionality such as online orders, PST Repair Set's services and other functionality that we believe would be of interest and value to you. A Client is that who purchases any PST Repair Set, Inc. (PST Repair Set) product online through any PST Repair Set website. The email sent by PST Repair Set or payment gateway on purchase of the product/software online. The email contains the activation code for product/software for activating the product/software. All our products have an Electronic Delivery. All software distributed under the Try Before Buy License. The Client has the right to request a refund for the PST Repair Set product/software within 30 days of the date of purchase if your case falls in the following refund guidelines. The purchase should have been made directly through PST Repair Set. PST Repair Set is not responsible for miss-interpretation by the client of the material published as part of promoting the product/software by our company. In such case, the responsibility lies with the client to get the right interpretation from the PST Repair Set support staff. Refund will only be done when signed Letter of Destruction in the form of an email that is received by the client. PST Repair Set should receive the email at sales.questions@pstrepairkit.com within 30 days of the date of purchase of the PST Repair Set product/software. Letter Of Destruction implies that the client states in written form that the product/software bought from PST Repair Set will be destroyed from all machines where it has been installed, all backup copies were deleted also and also allow a authorized person from PST Repair Set to do a physical inspection of all the machines where it was installed to ensure the destruction is done properly. The inspection can happen anytime within 3 (three) years of the date of purchase of the product/software from PST Repair Set. The inspection can happen without prior notice to the client. Any evidence of the refund product/software is entitled to be entered in legal proceedings. From the date of receiving the Letter of Destruction from the client, the refund will be processed within 15 days. Any delay of more than 15 days will be notified to the client through email from PST Repair Set. If the full licensed version of any software works, but not completely, then we will provide a solution for that. You can contact the support team in case the software you purchased fails to execute operations that are promised to be done. After analyzing and studying the issue, our technical expert will provide you with a suitable solution and then also if the issue is not solved and still exists, then we will refund your money that was provided while purchasing the product and the amount will be determined according to the task and issues solved by our software. 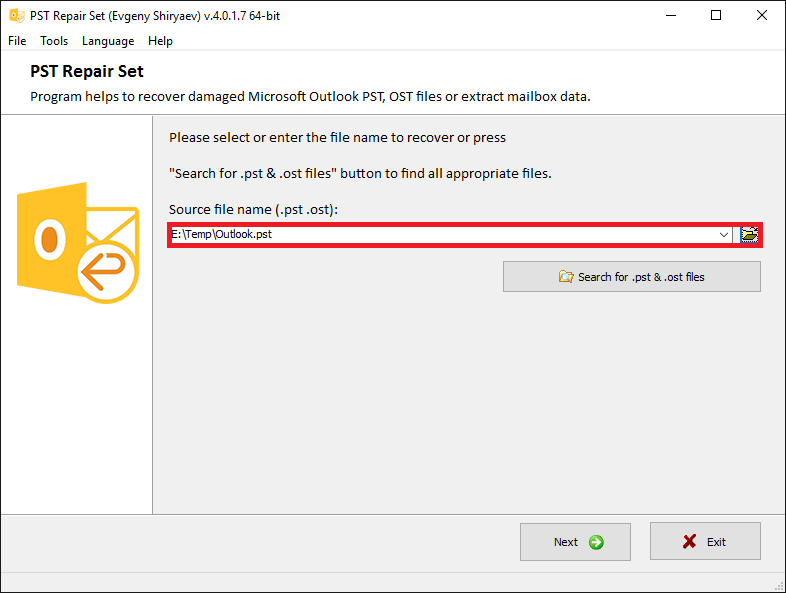 PST Repair Set does not decrypt encrypted Microsoft SQL Server databases, Excel, Word, Lotus Notes Database, and so on. Furthermore, clients are clearly informed not to use the software in case of the emergence of a message like This database has local access protection and you are not authorized to access it locally. This information is clearly mentioned on all the product websites of this software. Therefore, the refund requests in this case are not valid. 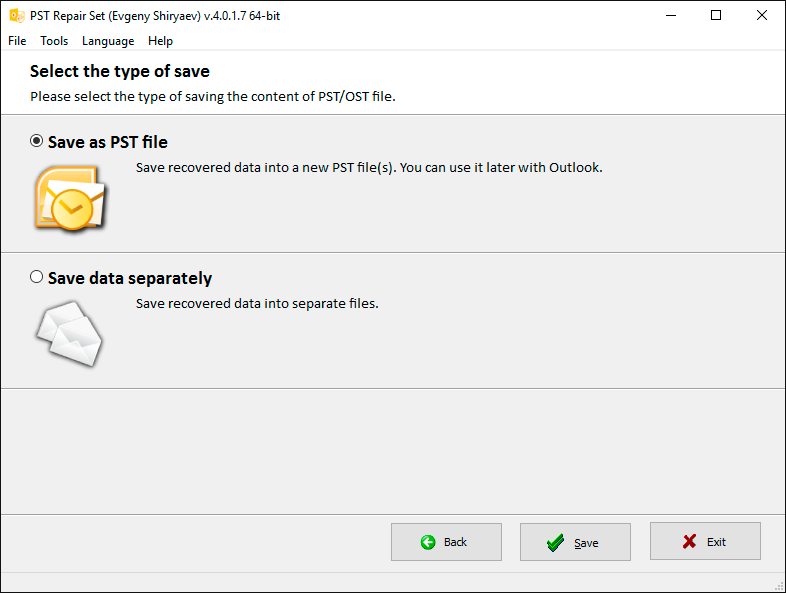 PST Repair Set reserves the right to make changes or updates with respect to or in the Content of the Web Site or the format thereof at any time without notice. PST Repair Set reserves the right to terminate or restrict access to the Web Site for any reason whatsoever at its sole discretion. Although care has been taken to ensure the accuracy of the information on this Web Site, PST Repair Set assumes no responsibility therefor. ALL CONTENT IS PROVIDED AS IS AND AS AVAILABLE. PST Repair Set HEREBY EXPRESSLY DISCLAIMS ANY REPRESENTATIONS OR WARRANTIES OF ANY KIND, EXPRESS OR IMPLIED, INCLUDING WITHOUT LIMITATION WARRANTIES OF MERCHANTABILITY, FITNESS FOR ANY PARTICULAR PURPOSE, NON-INFRINGEMENT, OR AS TO THE OPERATION OF THIS WEB SITE OR THE CONTENT. PST Repair Set DOES NOT WARRANT OR MAKE ANY REPRESENTATIONS AS TO THE SECURITY OF THIS WEB SITE. YOU ACKNOWLEDGE ANY INFORMATION SENT MAY BE INTERCEPTED IN TRANSMISSION OR OTHERWISE. 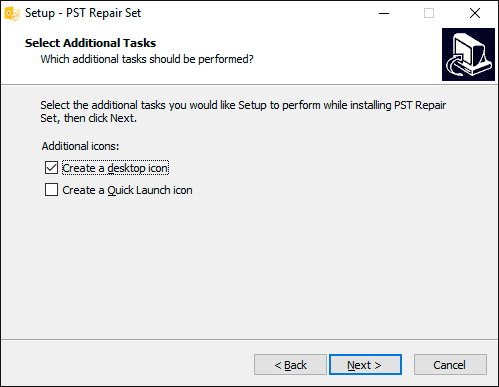 PST Repair Set DOES NOT WARRANT THAT THE WEB SITE OR THE SERVERS WHICH MAKE THIS WEB SITE AVAILABLE OR ELECTRONIC COMMUNICATIONS SENT BY PST Repair Set ARE FREE FROM VIRUSES OR ANY OTHER HARMFUL ELEMENTS. The Web Site may contain references to specific PST Repair Set products and services that may not be (readily) available in a particular country. Any such reference does not imply or warrant that any such products or services shall be available at any time in any particular country. IN NO EVENT SHALL PST Repair Set OR ANY OF ITS AFFILIATES BE LIABLE FOR ANY DIRECT, INDIRECT, CONSEQUENTIAL, PUNITIVE, SPECIAL OR INCIDENTAL DAMAGES (INCLUDING, WITHOUT LIMITATION, DAMAGES FOR LOSS OF BUSINESS, CONTRACT, REVENUE, DATA, INFORMATION OR BUSINESS INTERRUPTION), UNDER ANY THEORY OF LIABILITY, RESULTING FROM, ARISING OUT OF OR IN CONNECTION WITH THE USE OF, OR INABILITY TO USE THIS WEB SITE OR THE CONTENT, PRODUCTS, SERVICES, THE STATEMENTS OR ACTIONS OF ANY THIRD PARTY ON OR THROUGH THIS SITEM ANY UNAUTHORIZED ACCESS TO OR ALTERATION OF YOUR TRANSMISSION OR DATA, ANY INFORMATION THAT IS SENT OR RECEVIED, OR NOT SENT OR RECEIVED, ANY FAILURE TO STORE DATA, ANY LOSS OF DATA, LOSS OR DAMAGE TO FILES, LOSS OR DAMAGE TO THE CONTENT, ANY SERVICES AVAILABLE THROUGH THE SITE THAT ARE DELAYED OR INTERRUPTED, EVEN IF PST Repair Set HAS BEEN ADVISED OF THE POSSIBILITY OF SUCH DAMAGES. ANY ACTION BROUGHT AGAINST PST Repair Set PERTAINING TO OR IN CONNECTION WITH THIS WEB SITE MUST BE COMMENCED AND NOTIFIED TO PST Repair Set IN WRITING WITHIN ONE (1) YEAR AFTER THE DATE THE CAUSE FOR ACTION AROSE. This Web Site may provide links to other web sites that are not under the control of PST Repair Set. PST Repair Set shall not be responsible in any way for the content of such other web sites. PST Repair Set provides such links only as a convenience to the user of this Web Site, and the inclusion of any link to any such web sites does not imply endorsement by PST Repair Set of the content of such web sites. Copyright, trademark and all other proprietary rights in the Content (including but not limited to software, services, audio, video, text and photographs) rests with PST Repair Set Ltd. or its licensors. All rights in the Content not expressly granted herein are reserved. You agree not to copy, republish, frame, download, transmit, modify, rent, lease, loan, sell, assign, distribute, license, sublicense, reverse engineer, or create derivative works based on the Site, its Products or its Services except as expressly authorized herein. Except as otherwise provided, the Content published on this Web Site may be reproduced or distributed in unmodified form for personal non-commercial use only. Any other use of the Content, including without limitation distribution, reproduction, modification, display or transmission without the prior written consent of PST Repair Set is strictly prohibited. All copyright and other proprietary notices shall be retained on all reproductions. This web site may contain trademarks, service marks, trade names and logos of third parties. PST Repair Set uses them solely to describe the functionality of its products and provide accurate information about the use of the products. PST Repair Set hereby disclaims any rights to trademarks, service marks, trade names, logos, copyright, patents, domain names or other intellectual property interests of third parties. All intellectual property interests of third parties listed above are the properties of their respective owners. PST Repair Set disclaims any proprietary interests in the intellectual property rights other than their own. Any material or information sent through or in connection with this Web Site by you (User Materials) will be treated as non-confidential and non-proprietary, and immediately become the property of PST Repair Set, subject to any privacy policies posted on this Web Site. PST Repair Set may use such User Materials as it deems fit, anywhere in the world, without obligation for compensation, and free of any moral rights, intellectual property rights and/or other proprietary rights in or to such User Materials. Software made available for downloading from or through this Web Site is licensed subject to the terms of the applicable end use license agreement. 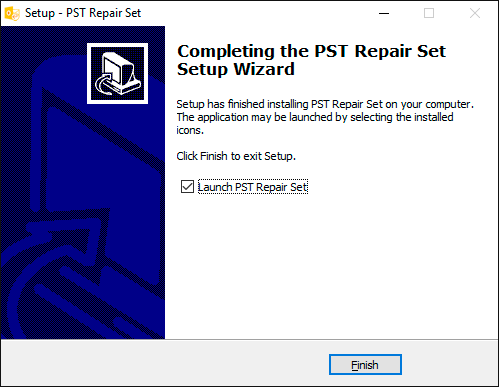 Both the Software and any accompanying documentation made available through this Web Site is the copyrighted work of PST Repair Set. Except as set forth in the applicable end user license agreement, the software is made available for use by end users only and any further copying, reproduction or redistribution of the software is expressly prohibited. You must agree to the terms of the applicable end user license agreement to download or order Products or Services from this Web Site. WARRANTIES, IF ANY, WITH RESPECT TO SUCH SOFTWARE SHALL ONLY APPLY AS EXPRESSLY SET FORTH IN THE APPLICABLE END USER LICENSE AGREEMENT. PST Repair Set HEREBY EXPRESSLY DISCLAIMS ALL FURTHER REPRESENTATIONS AND WARRANTIES OF ANY KIND, EXPRESS OR IMPLIED, INCLUDING WARRANTIES OF MERCHANTABILITY, FITNESS FOR ANY PARTICULAR PURPOSE OR NON-INFRINGEMENT WITH RESPECT TO THE SOFTWARE. Without limiting the foregoing, PST Repair Set makes no warranty that: the services and products will meet your requirements; the services and products will be uninterrupted, timely, secure, or error-free; the results that may be obtained from the use of the services or materials will be effective, accurate, or reliable; the quality of any services or products purchased or accessible by you through the site will meet your expectations; any errors in the software obtained from or used through the site, or any defects in the site, its services or products, will be corrected. Password recovery programs offered on this Site are designed for legal purposes and they are legal as long as you use them for legal purposes. 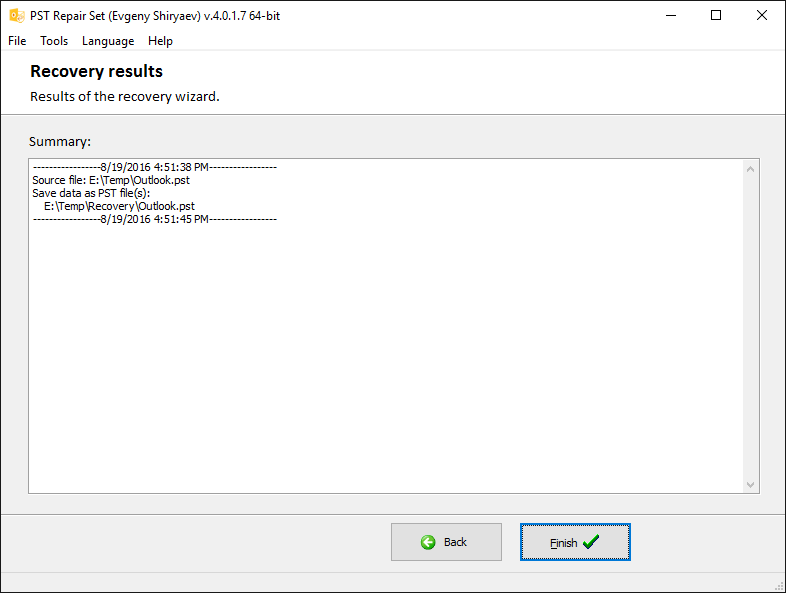 Thus, you can use PST Repair Set products provided that you are the legal owner of all files or data you are going to recover through the use of our software or have the right or permission from the legitimate owner to perform these acts. Any illegal use of our software will be solely your responsibility. A Guestbook is available on this Web Site for public comment by customers and visitors alike. Any notes, postings, ideas, suggestions, concepts, or other material submitted through this feature will become the property of PST Repair Set and PST Repair Set shall be entitled to use such material for any type of use forever, including in any media whether now known or hereafter devised. Linking to the Web Site is permitted provided that you comply with the following rules. You may link to the home page of the Web Site or to any other page of the Web Site. However you are not allowed to use in-line linking or framing. You must not imply that PST Repair Set endorses or sponsors the linker or its site, products or services. You must not use our intellectual property including but not limited to trademarks, trade name, copyright without advance written permission from PST Repair Set. Furthermore, you agree to remove the link at any time upon our request. PST Repair Set has a strict return policy due to the nature of our products. 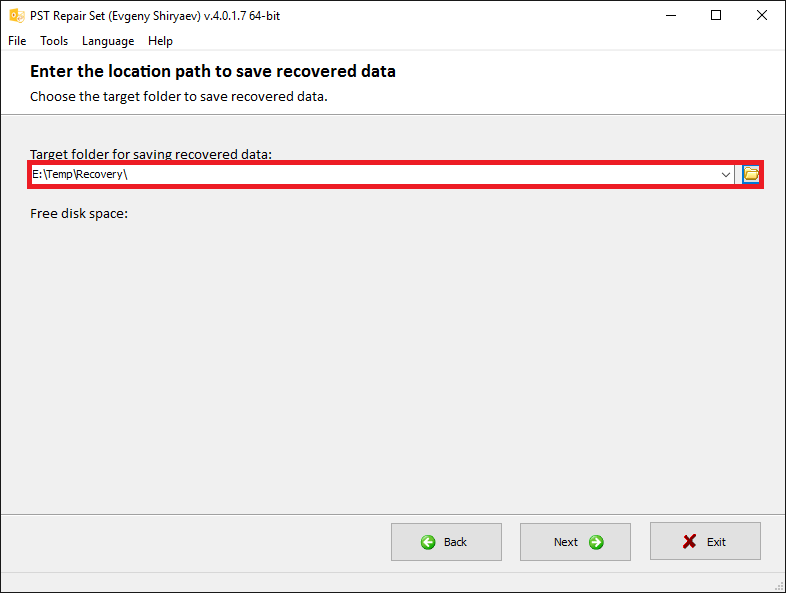 If the software is unable to recover (or remove, or change) a password, a copy of the unrecovered file MUST be sent to PST Repair Set, and our engineers will work with your file. 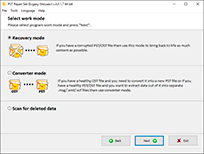 If the password is recovered, the owner of the software will be either able to keep the software and receive the password to the file (or unprotected copy of the file), or refund can be made and the end user will need to pay for the in-house recovery in order to receive the password. If PST Repair Set is unable to recover the password, a full refund will be made. Please note that this is applicable only to situations when password recovery or removal is guaranteed without brute-force or dictionary attacks (for more information, refer to product documentation). PST Repair Set does not bear any responsibility nor assumes any risks if by any reason a product or a service made available on this Web Site breaches national law of any state. Those who access this Site do so on their own initiative and are responsible for compliance with their national laws. In order to comply with the new COPPA ruling, if you are younger than 13 years of age, you are forbidden from posting information on PST Repair Set's message boards without direct parental consent. 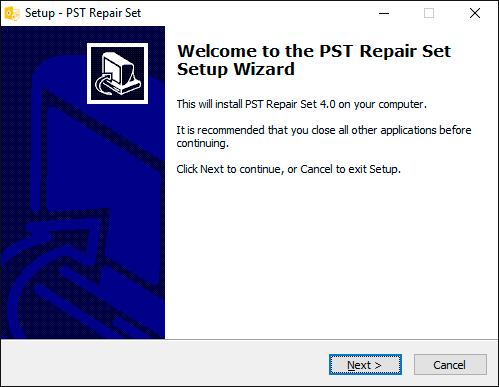 The PST Repair Set, Inc. software was developed by IT engineers with extensive experience in recovering damaged data files. We are so confident that we’ve designed the best software for repairing a customer’s corrupted files that we stand by our solution with a 100% satisfaction guarantee.